It's amazing the difference that four months can make. Back in October, large propaganda-like banners touting Gotye (adorning the registration room inside Judson Memorial Church at the CMJ Music and Arts festival) went mostly unnoticed-- with buzzed acts like Zola Jesus and Trash Talk hogging the conversation, despite his overseas popularity and the bubbling heat of his single "Somebody That I Used To Know," featuring another rising starlet Kimbra. All of a sudden, as if the dormant beast known as radio took a breather from the usual schlopp, "Somebody" made a meteoric run on the charts, and nearly everyone from housewife to hipster was converted into a fan. The music video for "Somebody" helped fuel the fire, with its distinct visuals. All the chatter turned into solid demand for Gotye's two planned shows in New York City and a third, at Terminal 5, was added and quickly sold out as well. The siren supporting him in "Somebody," Kimbra, has developed her own following in his wake and in some ways surpassed his influence, with solo appearances at SXSW and now a cult following here in America. But we could sit around and speculate about their prowess with facts and figures, or we can testify that the live show combining these two was something to behold from start to finish via personal experience. We're going with the latter. Last night's show at Webster Hall blew my expectations out of the water. First to strike was Kimbra, (commanding a small entourage of superfans in the front row), acting as both Lady Gaga-type peacock and bandleader for her setup (consisting of guitar, piano, and drums)-- by far the tightest backing band I've seen this year. I'd pay just to see Kimbra's band jam for an hour. Their skill manifested in energetic renditions of Kimbra's jazzy tunes, a high-octane performance which kept the entire audience engaged and entertained during highs and lows, despite (we assume) most never having heard any of her songs. Specifically the Nina Simone cover ("Plain Gold Ring") blew me away, with the band's tight arrangement and Kimbra's immensely talented vocals. Oh, those pipes. When she announced it was her birthday, the front row presented flowers and led the hall into song. Naturally, the piano player jumped in with ease. Is there anything that band can't do? 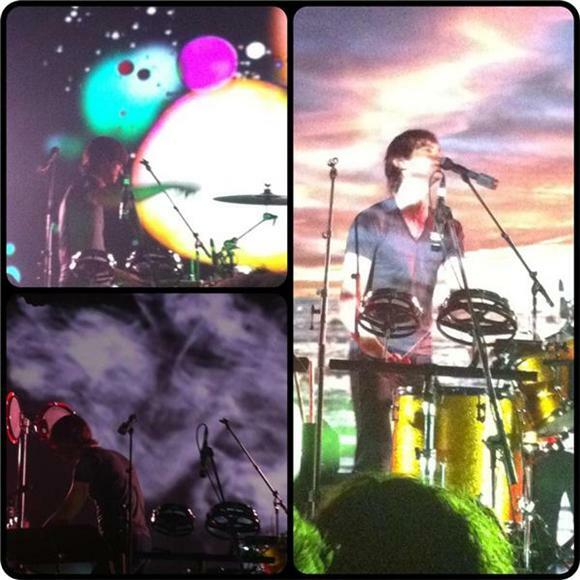 Gotye upped the ante (shockingly), performing in a circle of percussive gadgets and samplers with a huge backdrop of images that was synced up to the show. Some songs featured landscapes, with others assigned to psychedelic bursts of color. And then songs like "State Of The Art" got the full narrative-sync treatment-- this song's short featured an evil cartoon organ terrorizing a family of four. The visuals were fun, but despite their glitz, couldn't distract from Gotye's attention to sonic detail, often adding little accents like a minature bell or quick spurts of wood block. Not much to say, other than if we'd had seats, we would have been on the edge of them the entire set. The instrumental and percussive complexity of his songs, particularly the nuance of "Eyes Wide Open" or "Smoke and Mirrors," made the simplicity of "Somebody That I Used To Know" look like a nice break for the band, although it seemed like Gotye was working it pretty hard in the vocals department. Naturally, Kimbra returned to provide the counterpoint with her verse, and for a minute, it was easy, even exciting to believe these two performers might have a relationship deeper than the surface level of collaboration. Whether true or not, the crowd's belief in the tension was enough for a compelling performance, brilliant enough to distract from even the awful drunk girls in front of me who were eventually kicked to the back, amidst cheers from their neighbors as they exited. In short, an impressive and exciting evening.